I am back after the Oscars to squeeze in an entry for Moxie Fab World's Tuesday Trigger: Set the Table. 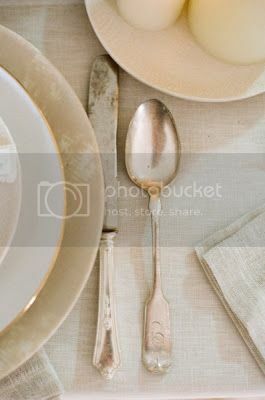 I was inspired by the colors, shapes of the plates, the linen and silverware. I chose an older patterned paper from Basic Grey's Nook & Pantry collection which has a linen design to cut a couple of circles from with a circle of gold sandwiched in between. The other patterned paper is a pale grey by Basic Grey from their Basics collection with a distress that reminds me of the tarnished silverware. I stamped a sentiment onto a strip of vellum which reminds me of the shape of a napkin using Mama Elephant's Midnight Letters (can't get enough of them since I finally inked them up this week) in a brown ink I stamped off once before stamping upon the vellum and gold glitter Thickers. The sentiment is part of a quote from the great movie "Auntie Mame" (the rest of the sentiment is: "...and most poor suckers are starving to death"). On the main circle I stamped utensils with soft stone which peeks through the vellum very subtly. I attached the vellum to the card by hand sewing with gold thread. With enough practice I may become a mediocre sewer. One can dream. I am off to get some sleep. Have a marvelous Monday! Fab take on the trigger. 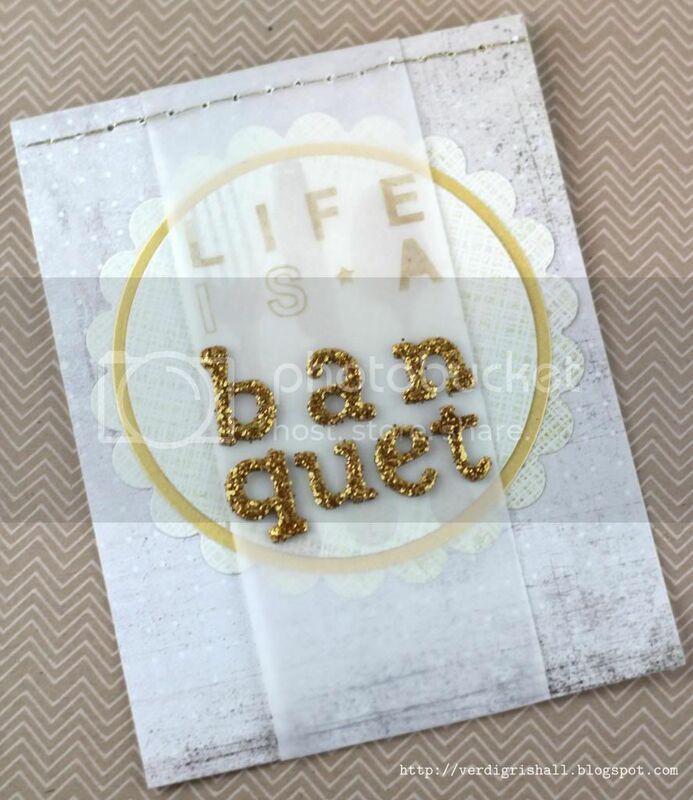 Love the lettering on the vellum and such a great idea to stitch it in place! This is awesome Shay!! 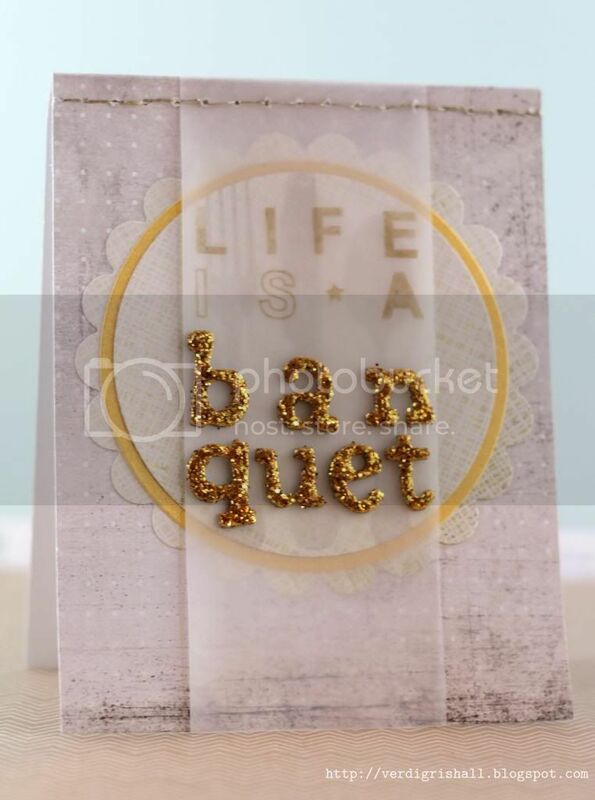 Was really interesting to read about where and how you took your inspiration for this beautiful card! And I hear ya on the Midnight Letters set - I want to use them on everything! !